On August 24, 2007 Michael Vick plead guilty to one count of Conspiracy to Travel in Interstate Commerce in Aid of Unlawful Activities and to Sponsor a Dog in an Animal Fighting Venture, in violation of 18 U.S.C. 371. U.S. District Judge Henry E. Hudson sentenced Vick to twenty-three months in prison. 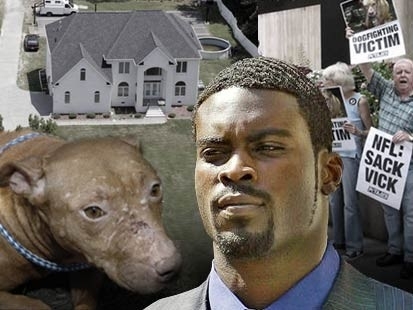 Vick admitted to organizing and running a dog fighting enterprise known as “Bad Newz Kennels,” where he oversaw not only the dog fights themselves (which often led to the death or maiming of at least one dog) but also admitted to directly participating in the killing of many dogs by hanging or drowning. Vick served his sentence, and upon release performed a token amount of public service work and promptly returned to the NFL as a quarterback for the Philadelphia Eagles, where he is still so employed. The initial widespread condemnation of Vick’s conduct was, I believe and hope, a reflection of our society’s heightened value for the well being of animals. Sponsors dropped Vick immediately, as did his former team, the Atlanta Falcons. There was no place for him in our accepted culture. Currently in 2012, however, Vick is still controversial but not nearly the most polarizing figure in professional sports (that honor is bestowed to Tim Tebow who, to my knowledge, has not tortured or killed any animals). He doesn’t have the lucrative endorsement deals anymore, but Vick still gets paid millions of dollars to play a game on national television. His Eagles jersey is one of the top selling in the NFL. The question is, what does this say about us and how we value animal life? One could conclude that we comprise a society that believes in forgiveness and recognizes when someone has paid for their mistakes. On the other hand, it could also be argued that people have short memories and no qualms with proudly wearing a player’s name on their back because he can run fast and throw a football, regardless of his moral character. But this post isn’t about dog fighting, the NFL, federal prison, or interstate commerce. It’s about the Westin Hotel in Providence, Rhode Island. On a Monday morning in mid-August, my wife, our two dogs, and I were staying at the Westin Hotel in Providence (the Westin is dog-friendly, by the way). We have two dogs: a small, 15 lbs chihuahua-pug mix and a large, 60 lbs golden retriever-poodle mix (often called a “goldendoodle“). The four of us were in the elevator. I was carrying the luggage and my wife had the dogs. Both dogs are generally extraordinarily well behaved. The big dog is even a pet-assisted therapy dog, and she has worked with dozens of mentally and physically challenged individuals. She is, however, quite strong, and when she pulls she can easily over-power my wife. The elevator stopped and the doors opened before we got to our floor, but my wife erroneously started to get out. The big dog started to follow her and I, not wanting my wife to get over powered, grabbed her by the collar (the dog’s collar, not my wife’s). I also thought or meant to say “This isn’t our floor.” I learned later that what I actually said was “Don’t get out.” Simultaneously, I saw Michael Vick standing in the hotel hallway, seemingly waiting for the elevator. He gave me what I can only describe as a “weird” look. In my head, it seemed like some type of acknowledgement that he wasn’t welcome in the elevator with us and our four legged children. It’s also possible he didn’t even hear what I said. The doors closed with Vick still in the hallway. To this day I’m still not sure about the exact order of events. Did I see and recognize Vick first, followed by my grabbing our dog’s collar as a protective instinct? Or did it all happen in reverse, creating only an appearance of judgment and disapproval from Vick’s perspective. Since this encounter I have struggled with whether my reaction, intentional or not, was fair and appropriate. I doubt anyone could blame me for perhaps not wanting to share an elevator with someone with Vick’s past. At the same time, is there a point when forgiveness and reconciliation are appropriate? Would exposure to a therapy dog, even if for only a brief elevator ride, have had some rehabilitative effect? The Eagles were in Providence for a preseason game against the Patriots. The Eagles lost and Vick suffered a minor injury. For the first time in my life I was mildly happy about a Patriots victory. Perhaps I’ve answered my own questions. I do not think that Vick should be forgiven, and I too would have pulled my dog back if I saw Vick close by, just like I would protect my human child from a pervert. He did something so horrible, and something that he had little to no remorse about. He did his (short) time, and then went on with his life, while dogs around the world continued to be abused because of him: you know that more people engaged in dog fighting because Vick used to do it; some role model! Vick has become more of a hero and even the Black Clergy in Philadelphia went to the practice early on to support him not that they would care about the dogs he killed, I have no respect for them now either any more that I care about Vick’s career or wellbeing as I always wish he would get hurt during a game seriously. Forgiveness is selective when it comes to athletes who can never do enough wrong for people to get behind them, it’s because we do not value animal life and because we elevate athletes irrespective of their crimes. As far as I am concerned I hope he burns in hell big time! Perhaps a stupid question. Does Mr. Vick now own dogs? Would he be allowed to? Would you still be thinking about forgiveness if Vick’s victims were human? I disagree with peta’s use of comparing human victims to nonhuman atrocities because the staggering amount of human animals murdered is infinitesimal compared to nonhuman victims.Also human victims abuse nonhuman animals as well. There is NO comparison especially in the many ways they are murdered. Also peta itself is an abuser of nonhuman animals. The book Eternal Treblinka thoroughly researches this issue. As a vegan person of color, I find it frustrating when necrovores use issues of race to hide behind when the real issue is their speciesism.